Aspire Ventures | Medical Errors Third Leading Cause of Death in the U.S.
Medical Errors Third Leading Cause of Death in the U.S.
the consequences of healthcare’s shortcomings are far more serious than a long wait at the doctor’s office. 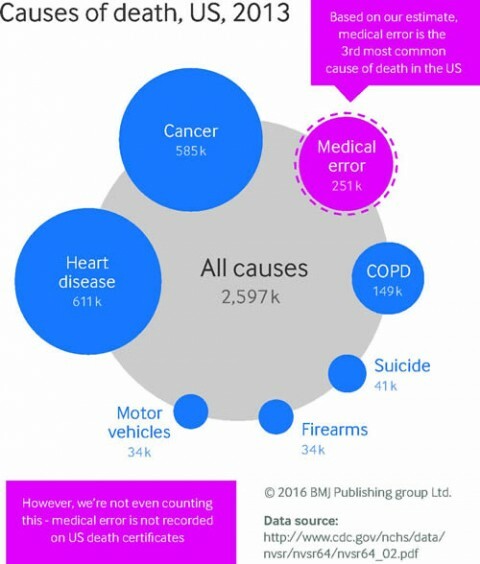 A recent report published in the British Medical Journal reaches the alarming conclusion that medical errors are the number 3 cause of death in the U.S., after heart disease and cancer. The report estimates that at least 250,000 people die a year from blunders in care at hospitals. The authors also guess that the number underestimates the actual toll because it doesn’t include deaths surgery centers, nursing homes, or other healthcare settings. Clearly, we have some room for improvement. Upgrading healthcare IT networks to standardize and centralize patient data without disrupting workflows; using machine learning and predictive analytics to make better use of that data; improving doctor/patient communication with mobile technology and the IoT; and delivering patient-centered care to keep patients actively involved in their healthcare are just a few ways that we can seriously reduce errors and improve outcomes. Although some of those changes will require major cultural shifts, the right technologies can transform culture so rapidly that we hardly realize it’s happened until long after the fact. And while some think it’s a long road ahead to change healthcare, here at Aspire we believe the future is much closer than it appears.